A little over a week has passed since the new utility skills went live on our Frontline beta, and we’ve had some time to discuss your feedback and make plans for our next step(s). While we were ready to rework any skill that people felt were too unbalanced or difficult/boring to use, it seems we won’t have to: most of the skills have received positive feedback, and the main points of discussion have been whether some skills have been too OP or not: often with different people claiming the very same skills are either too OP or too underwhelming. Hopefully these issues will be solved through some proper balancing. In regards to this, there’s a number of changes we want to do to Barrier specifically. First of all, we’ll change the color of the damage numbers that show up when the barrier is absorbing damage, as well as some kind of indicator for when the it’s is about to run out of HP. Hits on the barrier will also count as damage taken in Arcade Mode, meaning it will lower your score. You also won’t be able to resummon the barrier more than once per Arcade Room, since it’s such a powerful spell for getting through the floors (albeit with a drastically lower score). Now, as for what’s coming next…. Instead of polishing these skills further and adding them to stable, we’ll be finishing up a more or less complete rebalance of nearly all of the skills currently in the game. This will give our sound designer some time to crank out sound effects for the new ones, and makes for a bigger, more interesting stable update. * One handed weapons will do less damage. Right now they are a bit unbalanced compared to two handed weapons since you can hit way more often with 1H attacks. * Cast Speed will increase the speed of skills, and not just the charge time. An example of this would be the insect swarm dealing it’s damage faster (and by doing so, run out faster as well), the cloud summon hitting more often or your character finishing a blade flurry attack quicker. These will all be balanced properly, so that summons that block a portion of your EP won’t be affected as much by cast speed as skills that need to be recast. * We’ll experiment with being able to freeze bosses: Fred will look into suitable visual effects for this, which has been our main concern, as we can’t make individual freeze graphics that suits all bosses the same way we could with regular enemies. We’ll also make a change so there’s a bigger chance of freezing enemies that are chilled (slowed), or possibly that an enemy has to be chilled before it can be properly frozen. * The magic weapon improvement mentioned previously: the addition of an orb that unleashes from magic weapons as you hit. The orb will trigger when you’re too far away to reach an enemy with your attack, essentially increasing the range of all magic weapons. However, the orb in question will always do less damage than if your weapon hit the enemy directly, and the damage it makes will be based on your magic attack. * New talents, at least 5 per talent tree, with a maximum of 10 extra per tree, in order to avoid players having to read through too many talent descriptions to find what they’d like to level. These will be discussed in a later meeting. You might wonder what this new animation has to do with skill rebalance. The thing is, we found that some of the skills were a little lacking in effects, which made them feel less epic or impactful than they actually are. This is by no means true of all skills: so don’t worry, we won’t spend too much time on remaking skill animations now! In fact, for the most part, it’ll be minor adjustments to damage, speed or mechanics. For the fireball, though, it being the very first skill that was created, it was time for a little upgrade. This goes to show how far we’ve come as graphic artists: the first one being made several years ago, one of the earliest props of the game, while the latter is Fred’s latest version. It looks a lot better, right? Speaking of animations, we also have a brand new Focus animation! 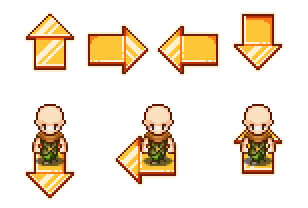 Since we wanted the player to be able to move around as they use this skill, we wanted the character to float in the air: both to make things easier for us, and since it just looks better when channeling the skill compared to trying to look zen while running around! With these new details you can actually begin to see things coming together a lot better. 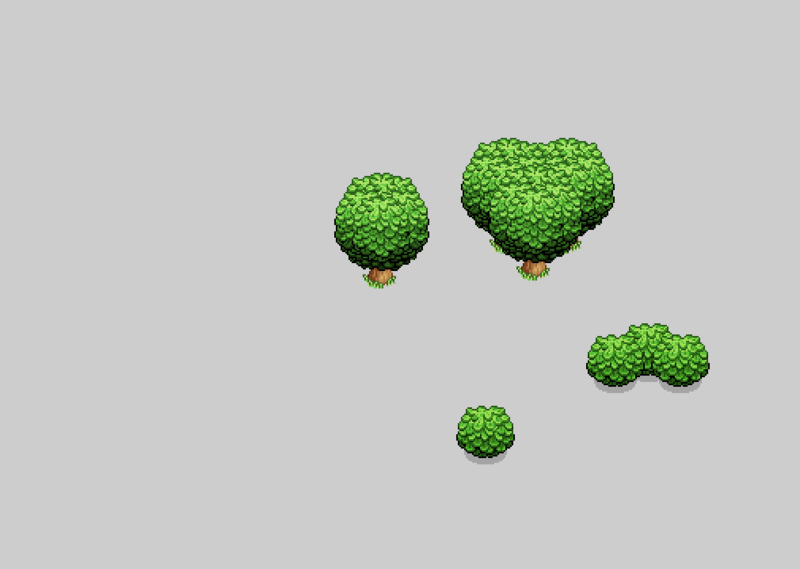 There’s still a bunch of extras that need to be made: a few trees and bushes, for instance, but the parts that have been made so far already look a lot more finished! 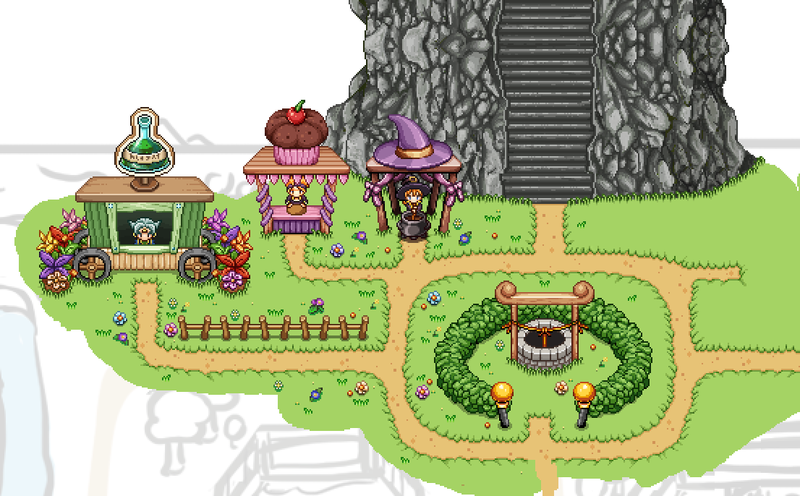 With Arcadia’s rework, we want this Arcade Mode town to feel different from the rest of the world, so almost all graphics will be made more or less from scratch, rather than reusing old sprites. 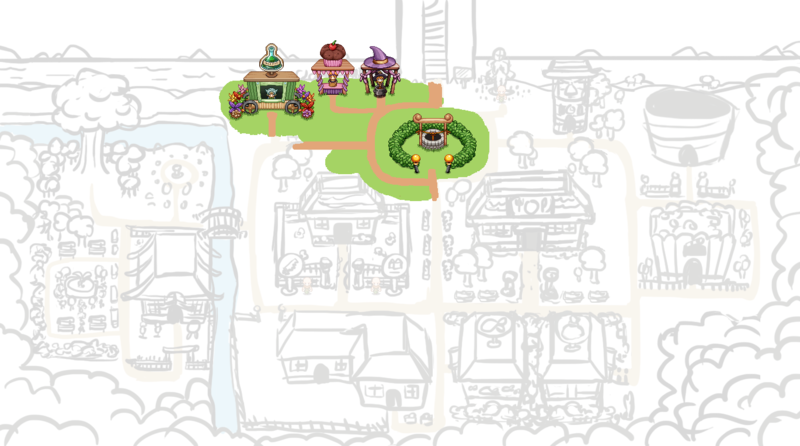 This means not only the buildings, but also the greenery needs to be remade. And the next step on that mission? 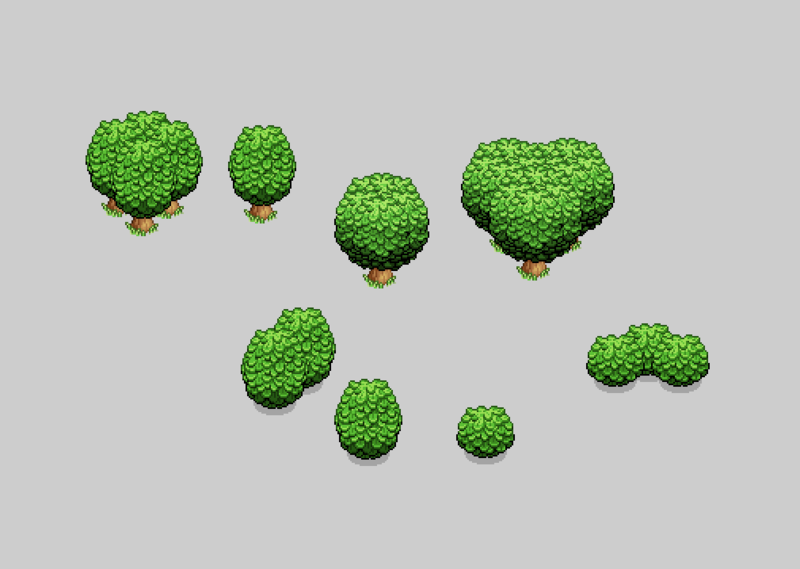 Trees and bushes! After a couple more weeks of designing, implementing, polishing and remaking, we have finally patched the frontline beta to include the new set of Utility skills! With the addition of these skills, we expect the game change a lot for some players, if not all – we suspect a lot of you have longed for something to use spare silver points on, and many of the Utility skills offer new paths of gameplay. In short, we can’t wait to see how you guys use them, and what the feedback will be. While we hope it will be possible to balance all of this properly (we’ve done our best so far, but we’re always ready for your feedback on what’s broken and what may be too lame), we are aware that depending on your feedback, we might have to rethink certain things. For instance, if every single one of you hate a specific skill! Because of this, it’s important to let us know what bothers you (and what you like!) so we know how to proceed. As always, feel free to share your opinions on this patch and the skills here or on the forums! Focus is the meditate skill which allows you to channel EP by holding the skill button, and allows you to cast a skill for free after a set amount of time. Since it’s EP focused, we decided to use a purple background (as the EP meter is purple). Our reasoning is that separating attack/castspeed from the damage buff allows for more varied builds, and each of the buffs can be stronger than they could be if they buffed more things. With that in mind, we’ll likely cap each of the Utility skills at three silver points as well, with each level making a bigger difference. Now that the buffs are in place, it’s time to implement the targeting system for them. As mentioned in a previous post, you’ll be able to buff your friends in multiplayer one at a time, with a system similar to what we use for the Frosty Friend: you start channeling the spell, and as you do so several arrows will appear showing your friends. Press in the direction of the friend you want to buff and the buff will land on them. To buff another friend, simply cast the spell again and press in another direction. In order to buff yourself, you’ll need to press upwards after channeling the spell – but only in multiplayer. In single player the buff will automatically target yourself. While this wasn’t exactly what we had in mind from the beginning, it kind of grew on us as we tried it out. At the very least it makes it easier to know which direction you need to press for which friend, as you can check what they’re doing right now and compare it to what’s going on in the arrows, while our previous idea would make things a little confusing if you had several friends with the same face and hairstyle. One might argue that this version is a lot more messy, and I supposed they’d be right: however, seeing as you’ll not bring up this interface a lot after confirming which direction your friends are in (most likely you’ll just quick-cast your buffs as seen below once you get a hang of it, anyway), we don’t view this as a too great drawback. As can also be seen above, if you bring up the cast menu again after buffing everyone, you’ll see a timer counting down on top of each character. These timers show how much time is left before the buff runs out, which makes it easier saving up EP. Once the buffs run out an icon and text will appear above each character which indicating that this has happened (as seen below). This will only be visible to the one who cast the buff(s). You can always recast a buff before it runs out, so long as you have the EP to do so. So the first thing we needed to decide was what kind of layout we want to use for these guys. Three in a row, or two next to each other with the buffs centered beneath them? From the beginning, what you see above is the effect we intended for the blink. However, because of how it looks when you’re not travelling in a straight line (for instance, if you blink diagonally), it became more of a hassle than we first anticipated. We could either rotate the effect in engine, which left us with a bunch of ugly artifacts, or we could have Fred make the effect in 8 directions – both options which weren’t too great. In the newest iteration, the globes are a bit smaller than what is seen in the above GIF, but it sill gives a good idea of what it looks like. The purple lines serve as a timer, of sorts. If you channel the spell until all four lines appear, you’ll be able to cast the next skill free of EP. We’ll also have a different channeling animation for this skill, possibly where the character is hovering above air – but at the time of writing this (which was before the patch) we’re still uncertain whether this will be available in the initial patch, or if it will be added in one of the many upcoming bug fixing patches once you start trying out (and breaking) these new skills! We’re not 100% it’ll look like this once it’s done (could be a little too big for a skill that will be cast rather frequently), but it’s just a bit too funny not to show! Last week was all about the Arcadia Rework for me, something which will continue to be the main focus for a long while to come. 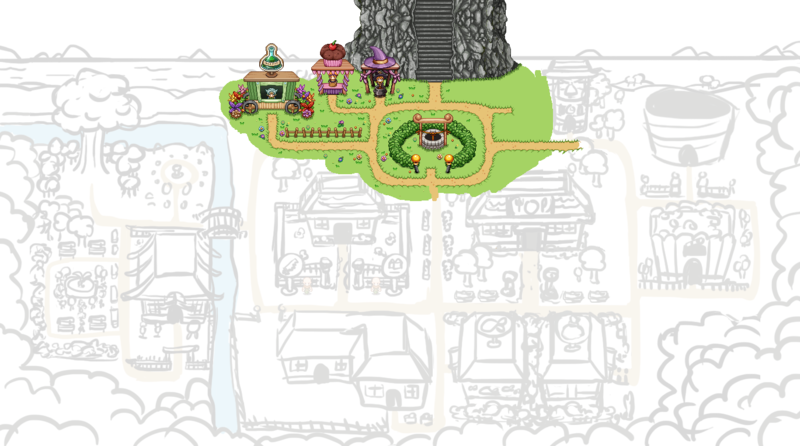 As you can tell, it’s coming along at a steady pace, one building at a time! 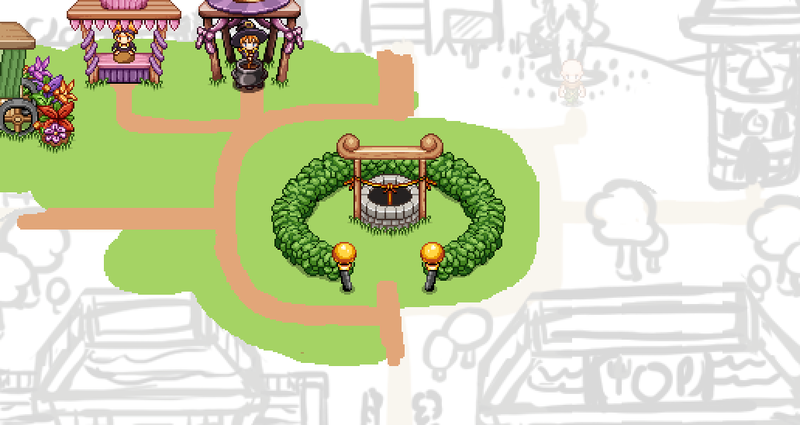 This week I will begin creating the underlying decorations, grass and paths between the various spaces. Since we’re also fairly sure about the Utility skills, I’ll also start creating their icons, while Teddy and Fred continue to deal with testing, testing, testing and skill graphics! We’ve had two major discussions these last few days, both in regards to the new Utility skills. First, about the buffs: we are currently disagreeing whether it’s better to keep them as we originally planned (one buff for the offensive stats and one for the defensive stats), or to separate them further. Specifically, there’s an idea it’d be more interesting the have speed be it’s own buff, allowing the current Haste skill to remain (only balanced so it’s more useful). However, there are those of us who feel the “package” buff is a more interesting buff to use, even if it means the speed stat won’t be buffed as much as it could have been if it were its own buff. Currently, we haven’t actually made up our minds about this! What do you think you guys would prefer? 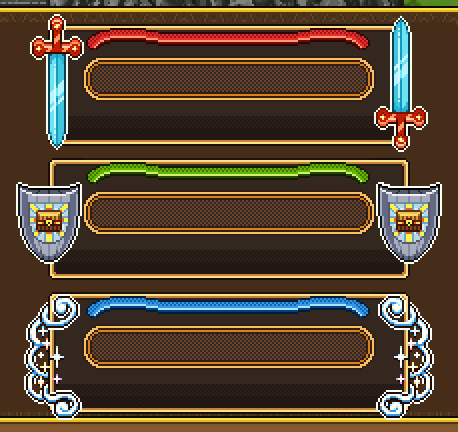 Two buffs: one for offense (damage, speed, crit) and one for defense (defense, shield reg, EP reg), or three: one for damage and crit, one for speed, and the defense buff left as is? We’ve also talked about the amount of silver points spent on each Utility skill. 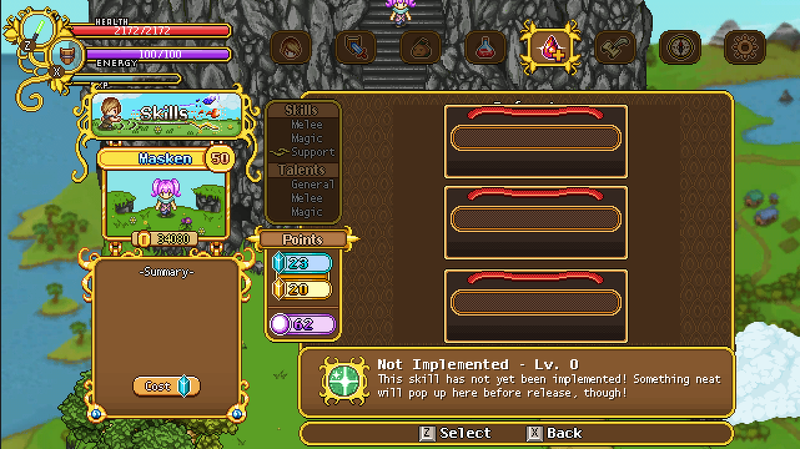 We’re considering whether to have each skill have 5 levels (as was planned), or if it’s better to cap them at 3 each. 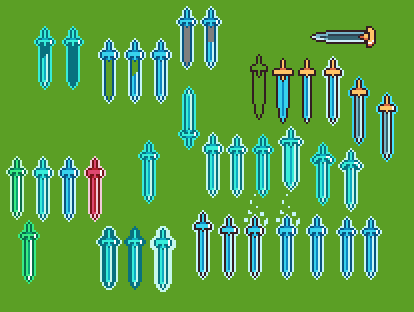 With 5 stages, the skills become more of an efficient silver point sink, but the skill improvement between each level will be rather small. With 3, each point spent on the skill will give a bigger upgrade, but you’ll also finish leveling the skills much sooner. Currently we’re leaning towards 3, as it seems more rewarding to the player that way, but we haven’t fully made up our minds yet. The idea is that, before you’ve unlocked this plot of land, the wagon won’t be there at all, leaving only some dirt in a half circle. A sign describing what will appear there will be in the middle of it, and we’ll probably use some flavor text, such as describing how an alchemist might be lured there if you just get some interesting plants for the dirt (done automatically by paying the amount needed by the sign). I have all kinds of ideas for this NPC, though I’m not entirely sure they will actually be realized, so I’ll keep quiet about them for now. All I can say is that Heero Yuy of Gundam Wing might have been an inspiration! In the current iteration we’ve decided not to go with our original plan, which was that a barrier break like the one seen above would cause you to take the remaining damage (if any) after the last of your barrier hp is used up. Instead, it’ll now absorb the whole attack, keeping you safe from harm even as it’s close to breaking. Our reasoning for this is that it feels more satisfying being able to completely shield yourself from harm, especially against strong enemies which might be able to hit through the barrier with just one attack. We’ll balance this by lowering the amount of hits and hp the barrier can shield you from instead, but if it still ends up too OP we might bring back our original plan. Of course, after a barrier break you won’t be able to recast the skill for a little while as well, as seen above. We’ve also begun implementing the Death Mark graphics seen in last week’s post! We are, however, considering changing it slightly, perhaps making the sword red and adding a skull, making it better fit its rather ominous name! Onwards we go! With some luck, these skills might be available as soon as this weekend for Frontline players, but it depends a lot of any more bugs that may surface as we continue to test these out. Fingers crossed! 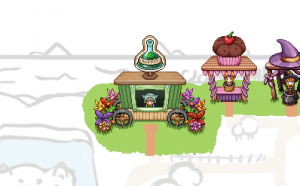 It’s another Monday, and work on the Utility skills is in full progress! First among them, we have the blink (as seen above). As mentioned in the earlier rundown of the utility skills, it auto-targets some distance away as you tap the button, but you can also move the target around (if you have the time). It’ll have a base cost of some energy, with a 20 more energy increase each time you spam it. If you stop using it for about 3 seconds currently, it will reset to the base cost. These costs will be lowered slightly for each silver point you spend on the skill, culminating in being able to use the first blink for free. The exact numbers are subject to change with further testing. Next, the shield/barrier! It has an amount of HP, much like your physical shield, based on a percentage of your own HP, which increased per level spent on the skill. It can take damage up to his amount, but will always break after 4 hits regardless of how much damage they do to your shield. If your barrier gets crushed, you’ll take the remaining damage from the attack (the amount it failed to shield you from) as regular damage and you won’t be able to recast the shield for a little while. Finally, the meditation/focus skill. It regenerates your EP faster the more you’ve leveled it, and if you channel it for two seconds the next skill you use will be cast free of EP cost. The circle underneath the character indicates when that happens! As for the Offense skills, we first have Death Mark! 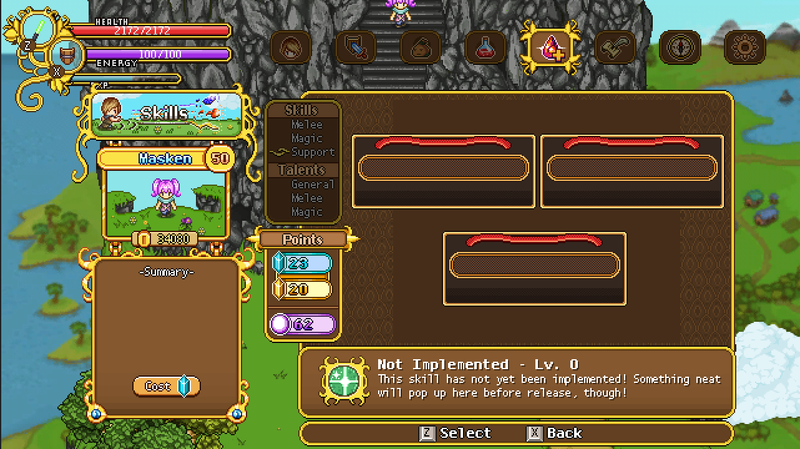 This skill has a new targeting system, which can be seen above. It basically aims at whatever enemy is the closest to your target, which you can move around the screen so long as you hold down the spell button. Everything you see here is prototype graphics, so it will likely look a lot different in the end, but the general gist of it is that as you do damage to a target with Death Mark, a meter of some sort (in this case it will probably be a sword) will start to fill up. Once a set amount of time has passed, the mark will trigger and deal bonus damage based on how much you’ve already damaged the target. The more you’ve filled the meter, the more damage it will do when it triggers – so you better try to get as much damage as possible on your target before that happens, to maximize the bonus damage. If the damage Death Mark will do is enough to kill the target, it will automatically trigger and execute the enemy for you before the timer runs out. Taunt/Challenge lacks all of the relevant graphics, but works much as described earlier: you challenge an enemy by shouting some insults at it, causing the both of you to deal more damage against each other. 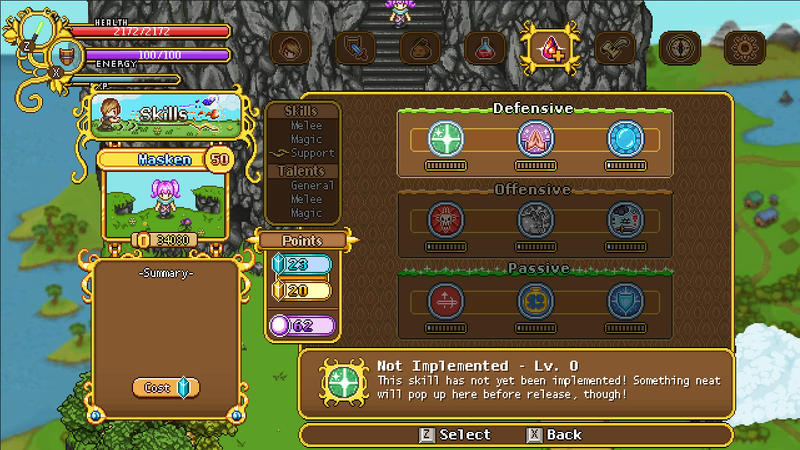 Upon leveling the skill, you’ll be able to target more enemies. Of course, in multiplayer, taunted enemies will prefer the taunting player when looking for things to attack, so your friends will be safe. Sleep, or rather, Stasis is the skill we’ve come the furthest with graphics wise. The mechanics are fairly straight forward and as described previously: the targeted enemy gets put in a stasis from which it’s released either when a new enemy gets put under the effect, when you hit it, or simply when the timer (individual for each type of enemy) runs out. And, since the Utility skills will be implemented much sooner than the desert enemies, Fred has paused the creation of those beast and began work on the spell effects needed! We felt Death Mark is the skill that’s perhaps the most reliant on the right graphics, and nearly impossible to really get a feel for without them: we want to be able to feel the urgency of trying to fill up that meter, and the satisfaction as it triggers and executes the enemy. The rest of this week we’ll be testing all the billion ways each spell can break the game (which they do, a lot), by playing through the entire thing using each spell on every enemy in every possible way. While we won’t be able to find all of the bugs or problems this way, hopefully it’ll make them more or less fully functional before we hand it over to you guys in the Frontline beta! Multiplayer will need a whole lot of testing of its own, both to make sure the effects are syncing up between users, and to bug test the friendly targeting (as some of the Utility skills will be used as buffs which can be cast on anyone in your party). At some point I will be called upon to make the proper skill icons for each of these, though I’m not sure if that will happen this week or later when we’re 500% sure these are the skills we’ll actually end up using (that is, once we’re certain none of them feel too boring as we try them out properly on our bug testing runs). Until then my art focus will be mainly on continuing the Arcadia Rework, as it’s what’s next on our to-do once the skills have been finished (and the occasional desert town portrait). Slow but steady! Fred, meanwhile will be focusing this week on creating more of the Utility skill animations and Teddy will be put on major polish and bug hunting duty. At the moment, we don’t have an ETA for when the skills will be available on Frontline: it’s all very dependent on how broken they end up being on these playthroughs. We’ve already had lots of talks about small edits we’d like to see on each of the abilities, so they’re not even in their finished form as it is right now! No major changes in terms of mechanics, but lots of tiny timing-things and such. For example, whether Death Mark should trigger automatically once the meter is full, or if it should still wait for the timer to run out. In this case we decided to keep the timer fairly short, and have it wait for it to run out before it triggers, even if you’ve done enough damage to fill the whole thing. Our reasoning for this is to make sure you can’t spam it too often, in multiplayer, for instance – as you’d be able to fill the meter a lot faster with four people who might all also have the ability (though we’ll try to balance this as well). Our goal is to make it fairly hard filling up the meter before the timer runs out, so it’ll be a bit of a fun challenge to try and fill it as much as you can when battling. And another week goes by! Last week we finalized Housing and finally managed to get a Stable patch up and running with the whole thing, meaning that (unless there are many more bugs that need fixing), it’s time to focus our attention on those Utility skills! 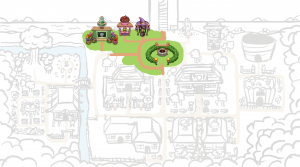 If you are one of those waiting for Stable updates, please go ahead and try housing out, and let us know about how to make it better in the future or any bugs you might find! The full patch notes can be viewed here! I know a lot of you are sad to hear about there still not being a healing skill, but hopefully the inclusion of the barrier skill will soothe that blow slightly, while still keeping true to our design. So far, we’re all happy about the skill ideas and hope you will be too! 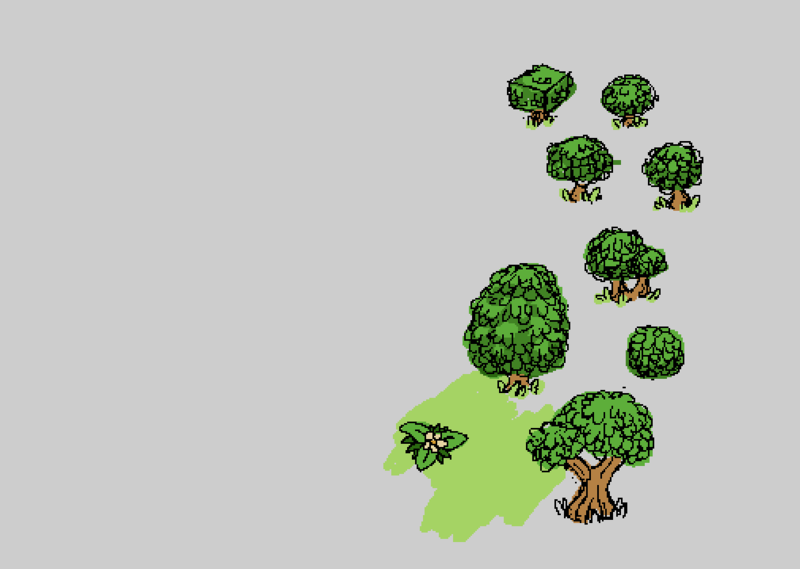 Teddy is currently prototyping the Utility skills using whiteboxing methods (meaning he’s winging the art with what we already have or extremely simple paint art), just to get a feel of how they’ll work in the actual game. Sometimes it becomes very clear even at this stage that some things just don’t work the way we’d like it to, and if that happens it’s unnecessary to have Fred make complex animations for skills that will get cut! For now though, let’s look at what’s been going on last week (aside from the stable patch)! First up, a list of those Utility skills mentioned last week! Keep in mind, all of the names are working names for now and the effects might differ slightly from the descriptions below, depending on how things work out in the prototyping stage. Challenge – A taunt of sorts, where you make one enemy focus his whole attention on you. This means that if the enemy is currently attacking someone else (in multiplayer for instance), it will immediately target you instead. Under this effect, you’ll deal more damage against this enemy, but it will also deal more damage against you. So, a double edged sword, if you will. The targeting works much like a projectile: your character will go into a shouting animation in the direction you’re currently facing, and the debuff will apply to the nearest enemy inside the effect. Death Mark – A debuff that uses a earth spike/meteor style target which you can move between enemies as you hold the skill button. Once you decide which enemy to target they will get a marker on them that will look like a meter of sorts. As you deal damage to this enemy, the meter will fill up and once it’s full or a timer runs out, it’ll deal a percentage of the damage you’ve already done to the enemy as bonus damage. It will also trigger immediately once the damage it’d deal is enough to kill the enemy. Sleep – A skill that puts an enemy to sleep and makes it unable to attack. However, if you hit the enemy it will wake up and return to battle. The duration each enemy sleeps may vary on their type and level. There will probably be a global limit for this skill, where only one enemy can be asleep at the same time. This means that if you or any of your friends cast the skill on another enemy, the one currently sleeping will wake up as the new one falls asleep. Meditate – A skill that you hold to regenerate EP at a greater speed. As we rebalance the skills it’s likely we’ll edit how EP works slightly, making it regenerate more slowly (among other things) – which means this skill will be more useful for more people than it might currently be. We also have an idea that if you charge x% of your EP and reach max using Meditate, the next spell will cast will be cast for free. Shield – A shield you can cast around yourself or a friend that absorbs some damage. If the shield HP runs low and you get hit by an attack that finishes off the shield, you will take the remaining damage of the shield-breaking attack, so beware! In single player, this shield is cast like a regular skill, while in multiplayer holding the button will bring you into a wheel (like when you control the Frosty Friend), which shows the faces of you and each of your friends characters. Press up to cast the shield on yourself, or right to cast it on player number two, etc. 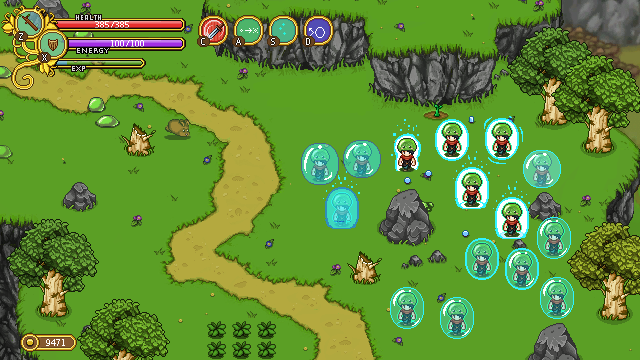 The shield will also have some kind of perfect guard effect, if you manage to cast it right before you or your friend would get hit by an incoming attack, but we haven’t decided exactly what this will be yet. Blink – A short-range teleport ability that auto targets some distance away. This means that if you tap the skill you will blink across the screen, but if you hold the button down you can move the target around to change where you land. Offense – Boosts damage, speed and crit. Defense – Boosts defense, shield regeneration and EP regeneration. Now, time for another portrait: the summer fae luring her winter fae friend to the desert town! As with the other harbor/desert town characters, nothing has been properly decided about these characters, but my general idea is that she took her friend with her, and while she enjoys herself he has a hard time dealing with the climate! I guess we’ll see if that story makes it in the end, once we finally start implementing the town. 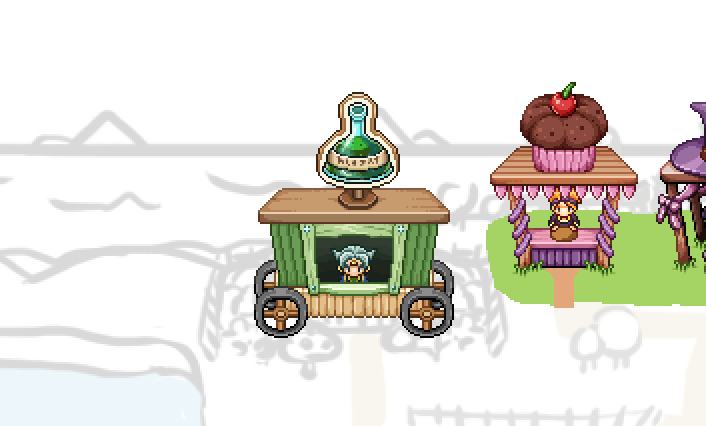 In this first part we focus on the wagon itself, and in the next we’ll add a bunch of interesting surroundings: strange and mystical flowers that have luring the alchemist to this remote town! 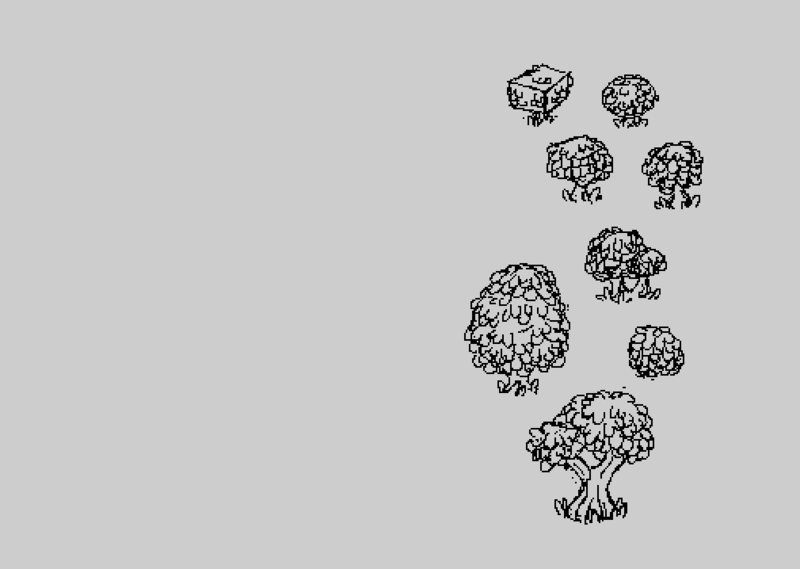 Finally, let’s end this week by taking a look at what Fred has kept himself busy with: the Solem animations! In order of appearance: Appear (spawn), attack, dig (for when he charges at you), grab (as he appears from beneath your feet to hit you), and a regular movement animation! Important to notes is that these are still in the ‘sketch’ stage, so they need some cleaning up (as you can see on a few, there are holes in the middle of the poor Solem). This is the way Fred prefers to work when he creates animations: first making a rough sketch, then filling in more and more details until they’re properly polished (and all holes removed).